This is the text of “Musings From Prashanthi Nilayam” aired on Radio Sai a few days ago. In this and some of the talks that would follow in subsequent weeks, I intend to say something about the Vedas. On the face of it, this is an atrocious proposition, considering that I cannot chant even a few hymns from the Vedas. Yet, despite this ignorance, the Vedas hold such a fascination for me that I cannot restrain myself from speaking about them. You might ask, “How can you talk about the Vedas when you know so little?” Good question but my reply is that though I know little about the technical aspects, I have been privileged to have a ringside view of some aspects, and it is on that I am largely going to base these talks. My earliest recollection of something to do with the Vedas goes back to about 1940 or so; maybe even a couple of years earlier. At that time, I occasionally paid a visit to Manamadurai, a small town about 40 km to the south east of the famous temple city of Madurai. 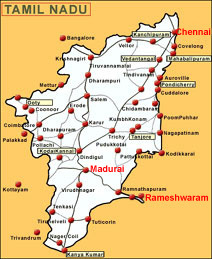 Manamadurai is in Ramnad District of Tamil Nadu, and is on the route from Madurai to Rameswaram on the South East coast of India, from where legend has it, that Rama launched His invasion of Lanka. Rameshwaram is thus a popular pilgrim centre. The British laid a rail track from Madras to Dhanushkodi just beyond Rameshwaram. Everyday, a train named the Boat Mail would go from Madras to Dhanushkodi and also back from Dhanushodki to Madras. This train would pass through Manamadurai, and the passage of the Boat Mail used to the big event there every day. The train would cross the River Vaigai across a bridge and lots of people would gather on the river sands just to catch a glimpse of the train as it went by. I have done it too. By the way, this train was called Boat Mail because it would carry mail from England meant for Madras (now Chennai) that came via Colombo. In those days, the big ships from England would sail direct to Colombo instead of to Madras. The mail would be unloaded there and sent by train to a place in Northern Ceylon, as Sri Lanka used to be called in those days. From there a small boat would carry the mail to Dhanuskodi where the mail would be transferred to the Boat Mail bound for Madras. 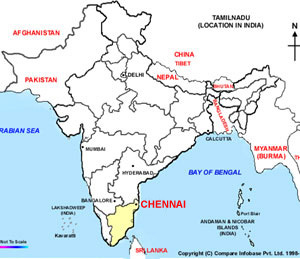 Mail from Madras to England would follow the reverse route. Now why am I mentioning all this in a talk that is supposed to be on the Vedas? Just to say something about Manamadurai, and a Vedic school there. This school was two doors away from the ancestral home of my father’s family, and in this house stayed two of my father’s elder brothers. I have gone there a few times, and invariably, I used to be fascinated by the non-stop chants coming from two doors away. This Vedic school or Veda Paatasala as it is technically known was apparently in existence for many, many decades, having been founded by a wealthy Chettiar family. For the record, I should mention that the Chettiars belong to the trading community, and in those days, trade and commerce took them to Burma, Malaya, Singapore and even places like Laos and Cambodia. The Chettiars were generally prosperous, and, in keeping with the traditions of those times, spent a good part of their wealth in charitable activities. For example, many of them endowed a lot of money for temples. Others built choultries or rest houses for pilgrims visiting holy shrines, like Rameswaram, or Tirupathi or Benares. Yet others established Veda Paatasalas like the one I mentioned a short while ago. 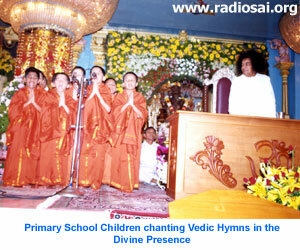 The Veda Paatasala was essentially a Vedic school, which, Brahmin boys, often from somewhat poor families, entered when they were very young, around five to seven years of age, after going through the Upanayanam ceremony. 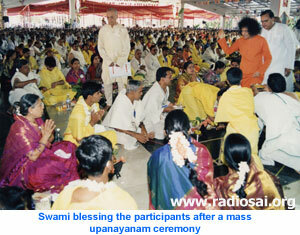 Many of you might have seen the mass Upanayanam ceremony performed by Swami from time to time. Well, what exactly is this ceremony and what is its significance? I shall make a few remarks on this here and maybe come back to this theme later for an in-depth exploration. To understand what this ceremony is all about, we must go back to the Vedic age, which means a few thousand years back in time. In those times, a boy born in a Brahmin family was allowed to roam around like a child without any restrictions till the age of five. On reaching that age, there was a change of gear, and the Upanayanam ceremony signalled this gear change. The ceremony was essentially an initiation into a disciplined life with strong emphasis on sense and Mind control and focus on God. One might wonder why all this? Was it not a severe infliction on a five-year old? Well, that is the way we would think, based on today’s environment. Five thousand and odd years ago, life was different and Brahmins had the duty of sustaining and spreading Spiritual Knowledge. In practical terms, it was the Brahmins who advised one and all, including kings, on matters relating to Dharma, and the observance of various rituals prescribed in the scriptures. The responsibility assigned to Brahmins was onerous, and the training for the job had to begin early. By the way, in later talks, I shall have much to say about many of these rituals and the Vedic Mantras chanted on those occasions. Let me get back to the Upanayanam. 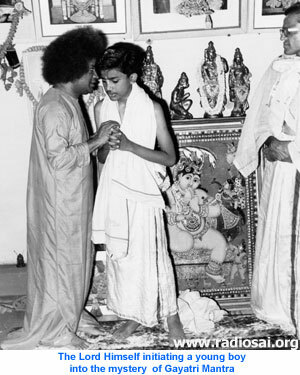 The high point of the ceremony is what is called the Brahmopadesam, and it consists in the father whispering the sacred Gayathri Mantra into the ear of the young boy. I am sure you all know about the Gayathri Mantra, especially since Swami has spoken about it so many times. I shall come back to it later. I am mentioning the Gayathri Mantra just by way of saying that once the boy hears it, he is supposed to be born again, spiritually this time. Childhood period is over, and as a result of this spiritual birth, his life now takes a different turn. I might in passing mention that the Jews have an initiation ceremony called Bar Mitzvah and the Parsi community too has an initiation ceremony. The details and even the objectives of these initiation ceremonies might not quite be the same as the Upanayanam ceremony but we might keep in mind the fact that many ancient societies did have a ceremony to mark the transition from childhood to boyhood. 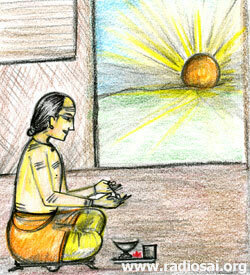 A boy who has undergone the Upanayanam ceremony is called Brahmachari. There is a mistaken notion that a Brahmachari means a bachelor. At the practical level, a Brahmachari is unmarried no doubt but, as Swami has pointed out, the word Brahmachari means much more and has nothing really to do with marital status. According to Swami, a true Brahmachari is one whose Mind is totally focussed on Brahman or God. This brings me back to the Veda Paatasala. In ancient times, the Brahmachari went to a Guru and spent many years in residence in his Ashram learning the Vedas and leading a disciplined life as enjoined in the scriptures. After completing the studies, which took many years, the Brahmachari would take respectful leave of the Guru and enter life. He would then get married, and serve society in every way possible, especially by guiding people of various communities who were not versed in the scriptures, on their duties in life. I have already made a brief reference to this a short while ago. Life changed with the passage of time, and by the nineteenth century, most Brahmins were engaged in tasks other than the propagation of scriptural knowledge. Many became prosperous landlords, wholly preoccupied in supervising agricultural activities on their farms. And when Western style schools and colleges were established by the British, many Brahmins happily embraced Western education, especially as it gave them an opportunity to enter professional life as an administrator in the Government, as a lawyer, as a teacher, as a doctor and so on. As a result of all such sociological forces, it became increasingly necessary to establish Vedic schools where priests could be trained. Please do not think that Vedic schools came into existence only because of the developments I have just mentioned. They existed even earlier, mainly to give Brahmin boys a serious exposure to the Vedas. But sociological changes made it more imperative than ever to have schools that would train people to become priests. To get back to Manamadurai and the Veda Paatasala there, I did not pay much attention to it; but its presence did register somewhere in my memory, and it was only years later that I appreciated the role this and other such Paatasalas played. For the record I must also mention that sometime in the fifties, Swami established a Veda Paatasala here in Prasanthinilayam. It was managed by late Sri Kamavadhani, a Vedic scholar par excellence. He lived to the ripe old age of one hundred, and I have heard Swami speak many times, most affectionately of Kamavadhanigaru. I have also had the privilege of seeing him a few times in his later years. 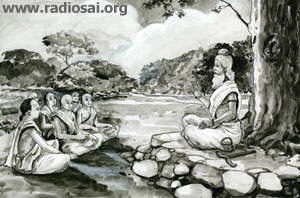 Swami established the Veda Paatasala not for training priests, but to expose Swami’s students to the importance of the Vedas and understanding the need to preserve them. Incidentally, there were no restrictions, and anyone who had a serious interest in the Vedas and a keenness to learn it was admitted to Swami’s Veda Paatasala. To put it differently, it was not a case of Brahmins only. It is thanks to the pioneering effort of late Kamavadhani, that we see so many students effortlessly chanting various portions of the Vedas almost every day during Darshan, both in the morning and in the evening. Let me now cut to the year 1947. That was when, on the insistence of my grandmother, my father performed the Upanayanam ceremony for me. It was a four-day affair, celebrated in the best of traditions, in a small village in South India very much given to tradition. There were many things associated with the ceremony that I positively detested but then I had no choice; I just had to obey. Many restrictions were placed on me that made me very angry at that time, but there was precious little I could do except to comply. One thing I realised then was that having undergone the Upanayanam ceremony, I was now required to perform a ritual called Sandhyavandham three times a day, once in the morning, once in the afternoon and once more in the evening. Among other things, as a part of this ritual I had to chant the Gayathri 32 times. My mother was very strict and would not give me food unless I had completed Sandhyavandanam. This would drive me mad but I had no choice. Strangely, I did not think of cheating. I don’t know why; I suppose it was all Divine Grace. Though with great reluctance, I somehow pushed myself everyday to chant all the Mantras, which I had sort of got by heart. What a profound thought! That is the beauty of the Vedas. Superficially they might be all about rituals, some of which might, in this day and age, appear not only irrelevant but also objectionable. But when one goes deeper, it is an entirely different matter. One cannot then but admire those ancients for the profundity of their wisdom. All this I shall discuss in detail later. By the way, I think it is appropriate to mention that Swami often quotes the last part of the Mantra I just referred to. Swami says, Sarva jeeva namaskaaram, Kesavam Pradhigatchathi. Sarva Jeeva tiraskaaram, Kesavam pradhigatchathi. The meaning is: all the salutations we offer to fellow humans ultimately reach the Lord. If instead of salutations we hurl abuse, they also eventually reach only the Lord. So, says Swami, we had better be careful about abusing others. We may think we are abusing so and so, but in reality it is God who is being abused. We wouldn’t want to do that, would we?